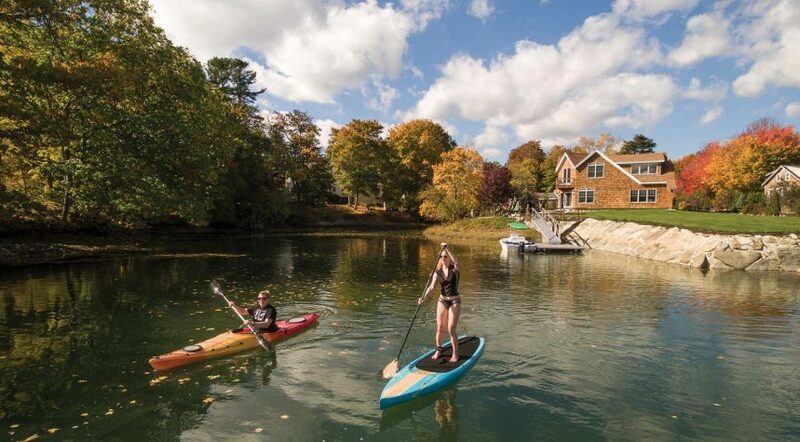 Heather and Greg Burke paddle on the Kennebunk River. Their house, designed by KW Architects and built by Timber Island Builders, features a tri-gable facade to take advantage of water views. 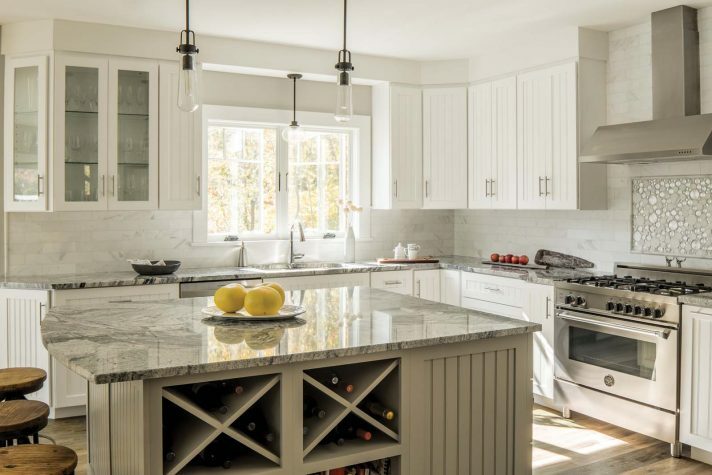 The kitchen cabinets are configured in a L-shape that surround an island topped with vividly veined Silver Cloud granite. 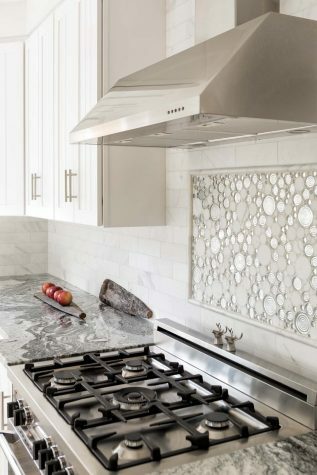 This final, eye-catching look was a happy accident: the slab the couple chose first, a subtler granite, split before it was ever installed. The bump-out in the owners’ suite creates a niche for the king-size bed. Stillness, a photo printed on canvas by Chris Lawrence of Maine Photography, hangs above it. Visible through the window, an archway connects the front of the house to the backyard. The great room combines living, dining, and kitchen areas. The coffee and end tables are the only items the Burkes brought from their former home. “We think that every home deserves its own furniture,” says Greg. The flooring looks like oak but is actually luxury vinyl, selected because it works well with radiant heating. The downstairs powder room is located between the garage and entryway. 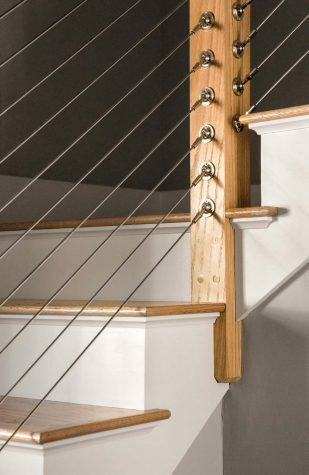 The stairway’s stainless-steel cable railing lends the entryway a nautical feel. 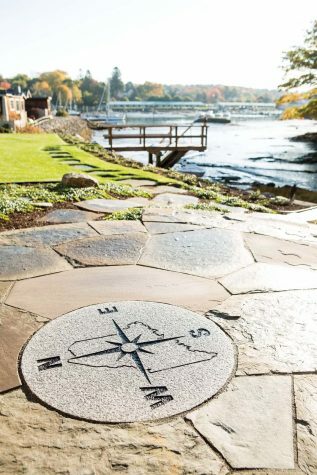 A carved compass rose made by Swenson Granite Works is set into the patio. The only place where the color blue is used in the home is on the front door. The exterior is red cedar, the walkway is bluestone, and the driveway is made from crushed seashells. The facade’s white paneling helps to conceal the fact that only four small windows appear on the front of the home. 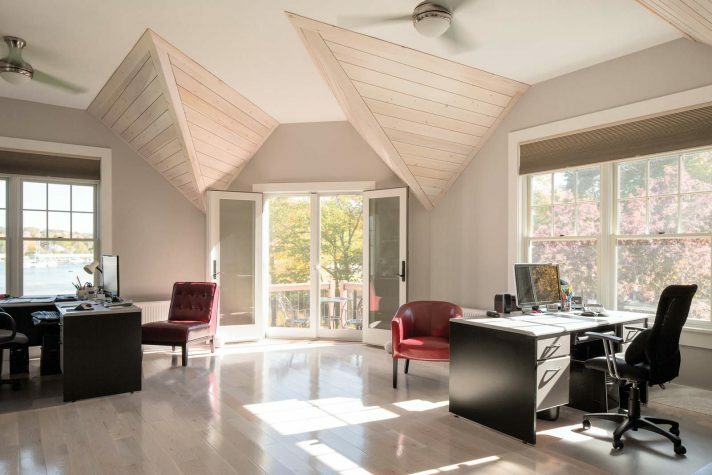 Gables in the home office are clad in whitewashed nickel-gap paneling, resulting in a look that resembles the hulls of ships. The glass balcony railing opens up the view to the river below. 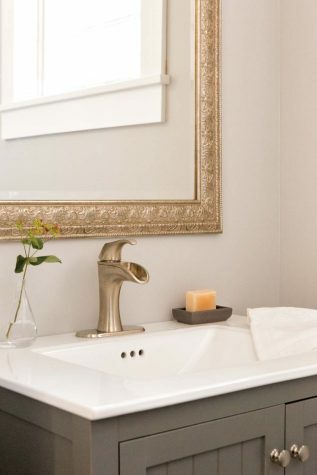 The Jack and Jill bathroom connects the home office to a bedroom that the Burkes’ son uses when he is home. The radiator doubles as a towel warmer. 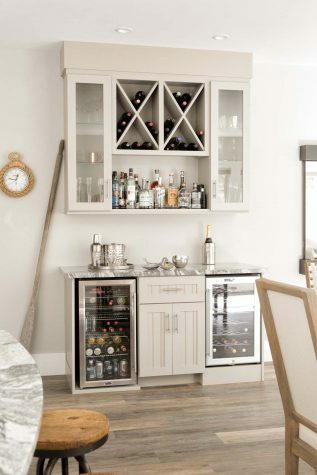 Opposite the dining area is the bar, which is topped in the same granite as the island. It features open wine storage in addition to beer and wine fridges. 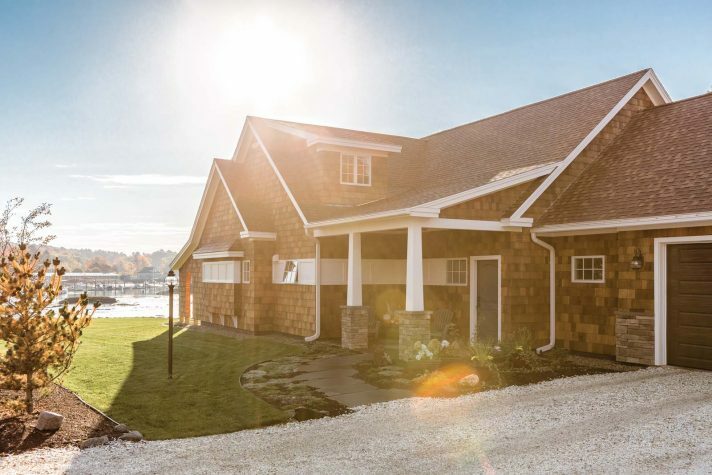 For several years, Greg and Heather Burke referred to their 36-foot boat docked at the Yachtsman in Kennebunkport as their “summer house.” The couple lived just three miles away in a modest colonial where they had raised their two children, but would spend evenings and weekends out on the water once the weather turned warm. It was while they were out on the boat that they first spied the “cute little Cape,” recalls Greg. The Burkes casually daydreamed about the home perched out over the water directly across the river from them, until one day a realtor’s sign went up. The couple put in a successful offer, knowing that the Cape, which had been cobbled together over decades dating back to the 1930s, would require a thorough renovation. 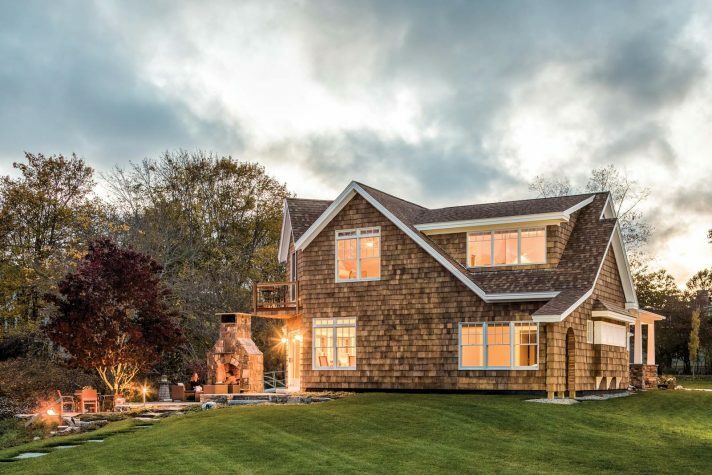 Finding the right builder was easy: Jake Gott of Timber Island Builders in Kennebunkport kept his own boat near the Burkes’ and had also admired the home. But on the first day of work, problems began to arise. “When we were doing demo, it was a full-moon high tide,” Gott says. “The water was practically right there in the kitchen. It was like being out on the boat.” The team discovered that tidal water actually flowed underneath the house. 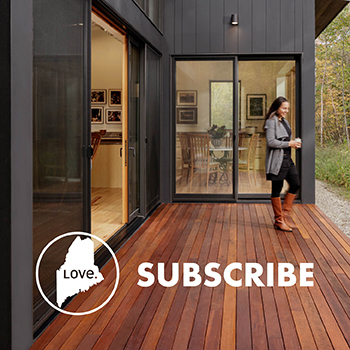 “It was a cool location,” Greg says, “But, as Gott pointed out to us, ‘You’re always going to have to babysit this house.’” With the elevation and the foundation presenting larger issues than initially realized, they decided to halt the work. “Three days in, we pulled the plug on our own renovation and said, ‘See you next year. We’ll have a bigger project for you then,’” says Greg. With the renovation scrapped, the team would start from scratch. Gott referred the Burkes to architect Kristi Kenney of KW Architects in Wells. Due to the Cape’s location in the shoreline protection zone, Kenney had to get creative with the layout in order to orient the new build toward the river. “We asked Kristi to open up her mind and do something different,” says Greg. Her solution was to draw up a rectangular floor plan in which the southwest corner is clipped off, and then, rather than having the linear mass parallel to the cove, pivoted it a few degrees toward the water to open up the views. Inside, the angled wall translates to oversized eight-foot sliding patio doors in the first-floor great room, which combines a kitchen, dining area, and living space. 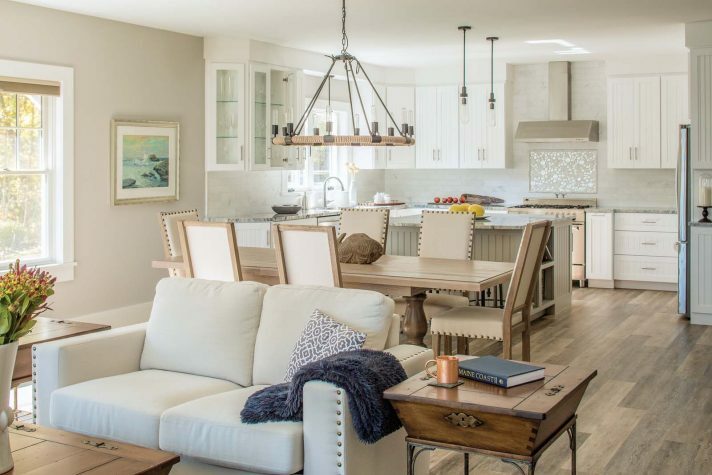 The sliding doors lead down to a terraced patio that affords generous views of the river and of Kennebunkport—hence the home’s name, Port Watch. Down lower still is the water, where the Burkes keep a pair of paddleboards, a kayak, and a small fishing boat. With the home’s coastal views, it would have been easy—perhaps even expected—to choose a typical blue-and-white nautical theme, but the couple opted instead for a sophisticated palette of warm grays. “Because we’re on the water, we brought in some colors from the beach and the ocean without doing the typical blue,” says Heather. 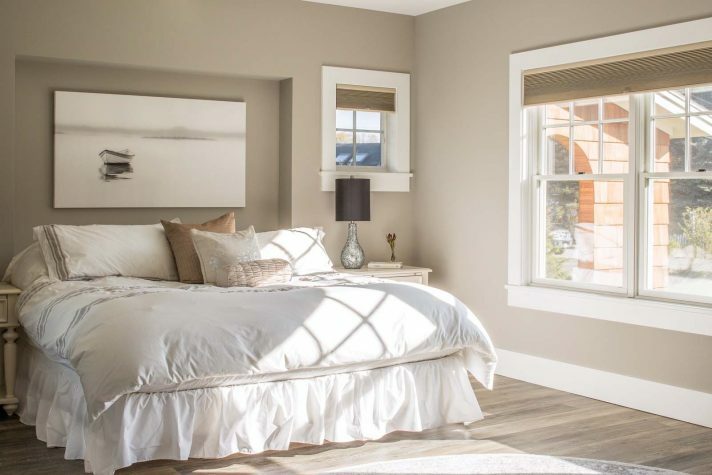 “It has a soothing effect.” Shades of paint range from London Fog to Stonington Gray to Silver Cloud to Stormy Monday. 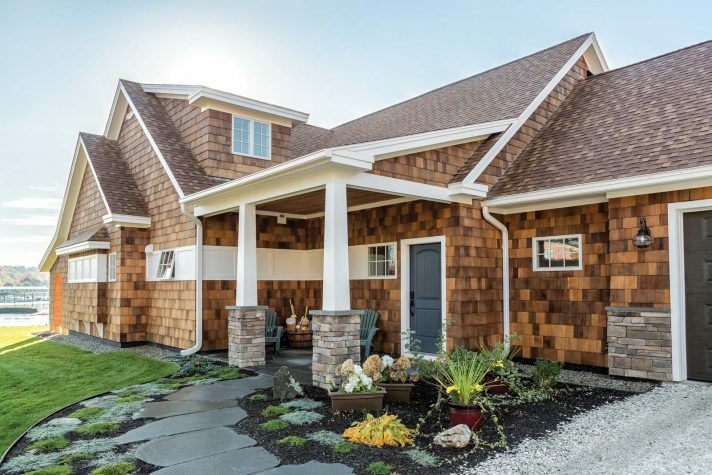 But the Burkes aren’t immune to a few subtle nods to the sea, such as the crushed seashell driveway, rope lighting fixtures, nickel-gap paneling in the entryway, and the Newburyport Blue front door. Small nautical details add an element of surprise, such as the carved stone whale on the outdoor fireplace—noticeable only after it’s been pointed out—and the carved granite compass rose set into the outdoor patio. The most coastal element of the home was a happy accident. The second-floor room that the Burkes use as their office is where a series of three gables meet in a cathedral ceiling. 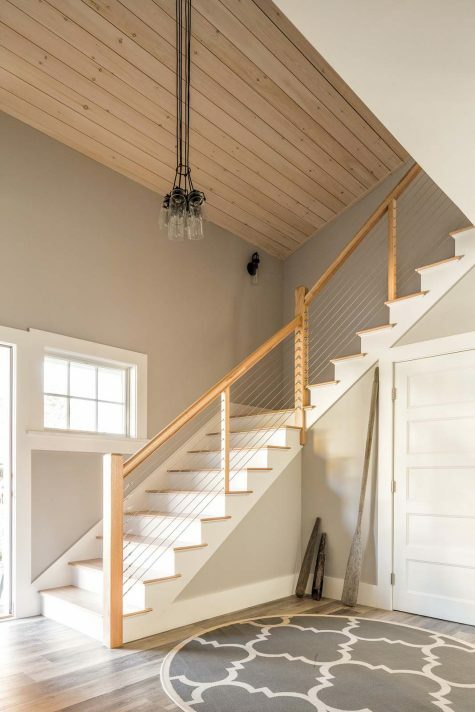 Although Kenney designed them originally as a space-saving measure to meet the shoreline volume requirements, they became particularly striking features when, during the building process, Gott had the idea to swathe them in the same whitewashed pine nickel-gap paneling that is used in the entryway. The finished effect gives the sensation of being underneath the hull of two ships. “It made the room one of the most interesting in the house,” says Kenney. French doors appear at the angled cutoff and lead out to a small balcony where the Burkes enjoy lunch breaks from working on their hospitality web marketing company. 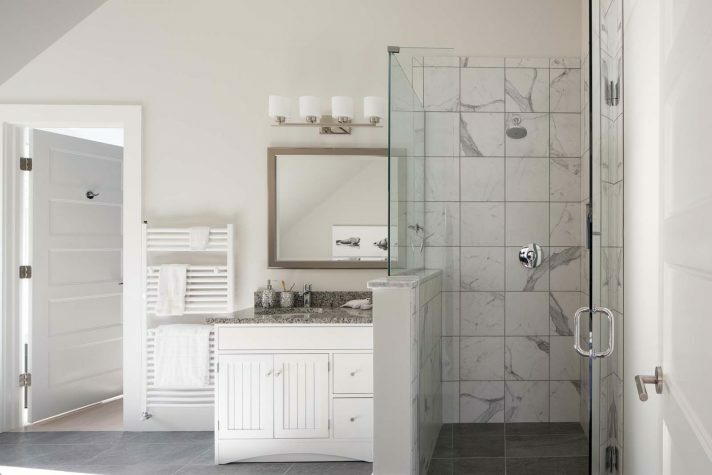 A Jack and Jill bathroom with a shower, freestanding tub, and chandelier connects the office to one of two upstairs bedrooms, which are used by the couple’s two 20-something children when they’re home. from the inside, you wouldn’t know it,” she says. The facade is also reduced in scale (belying the home’s 3,000-square-foot interior) but still manages to feel balanced and visually interesting, in part thanks to an archway that slopes down from the roofline that leads to the backyard. “It brings the roof back down to the ground and balances the porch on the other side,” says Kenney. A bump-out on the exterior, designed by Gott and Kenney to add visual interest, works inside as a de facto headboard for the king-size bed in the first-floor owners’ suite. Above the bed is a photo of a boat that also perfectly fits into the niche. 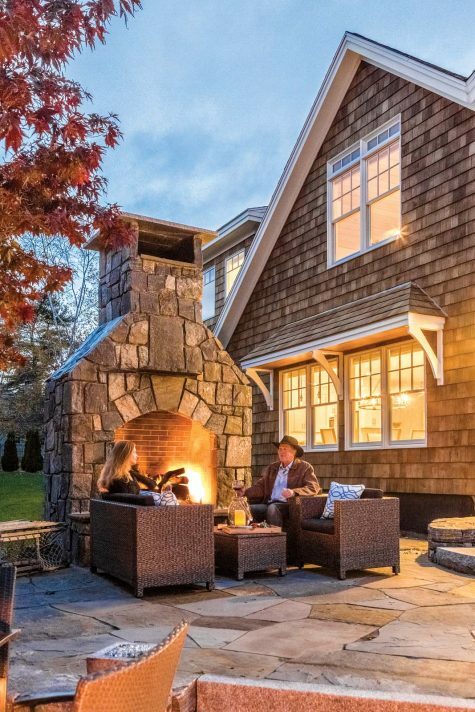 The outdoor stone fireplace and fire pit extend the summer season into cooler months. A lobster trap doubles as extra seating. The entryway features a stainless-steel cable railing that opens up the space. “It’s the only tension in the house,” jokes Heather. The nickel-gap paneling on the ceiling is whitewashed pine.